Sonya Kelly’s sweet, idiosyncratic tale How to Keep an Alien begins with a very bad play. Performing a Russian classic – in English – on the coast of Ireland, precipitates a career crisis for Kelly, but leads to her meeting Kate from Queensland, who is about to be deported. Despite moments of self-doubt, the two fall hopelessly in love and so begins the process with the National Immigration Bureau to establish their right to live as a couple permanently in Ireland. This autobiographical story follows the eight-month paper-trail of devotion that Kelly has to collate to prove their love to the government. Kelly’s journey of self-discovery prompts her to step out of her comfort zone and cross the world to meet her new, extended family. It’s not an easy process but she is spurred on by extracts from a pioneer ancestor of Kate’s and a gentle reminder of the timeless nature of immigration. The success of this play relies heavily on Kelly’s charm as a performer but ultimately it’s her sheer strength of will that wins you over. 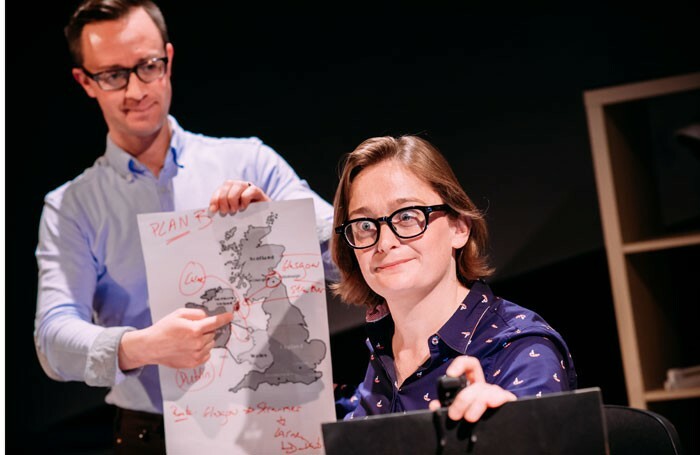 Ostensibly a one-woman show, Kelly is accompanied by her stage manager Justin Murphy, who offers an occasional response and provides a musical interlude of utterly random loveliness.